This blog post is dedicated to those who thought the world had already come up with the craziest ideas anyone could think of. I hope that they will realize that nature keeps reinventing itself and will never cease to surprise us. So here comes the craziest idea ever: The Share-A-Burger Initiative. 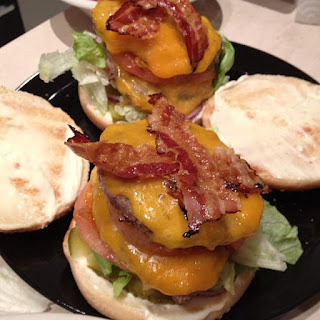 Well, it's fairly simple: Two years ago, I embarked on the bold endeavor of preparing the finest Sunday burger ever. After numerous attempts at Burger Xanadu, I, in all modesty, believe that I now hold the recipe for the perfect Sunday Burger. Subsequent to that realization, my purpose in life is to spread Burger wisdom throughout the world. And how better to do so than by sharing a Burger? Every Sunday evening, my wife and I prepare two extra Big Awesome Burgers. 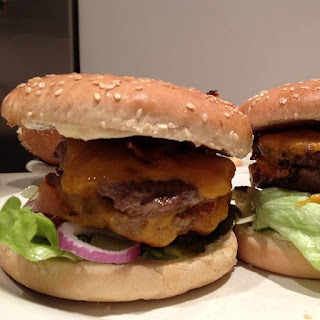 Every Sunday afternoons, we post a message on the Share-A-Burger facebook page. The first person to reply "Yo" to this message wins 2 Burgers that they can come pick up on the same day at 7:30pm at our place in Strasbourg, France. (The burgers are completely free). Feel free to start a Share-A-Burger facebook page in your city to share your Burger love! If we were all to share our recipes for Burgers with our neighbors, the world would be a better place. Granted we're not supposed to covet our neighbor's wife but it is perfectly ok to covet our neighbor's burgers! Together, we will change the world one Burger at a time. Let melted cheddar connect us all together and help us understand each other better.